Check out the advocacy panel from the National Vape Expo in Richmond featuring VSFA President Jay Taylor, Board Member Yan Gleyzer, and Legislative Team Member James Hoffman. 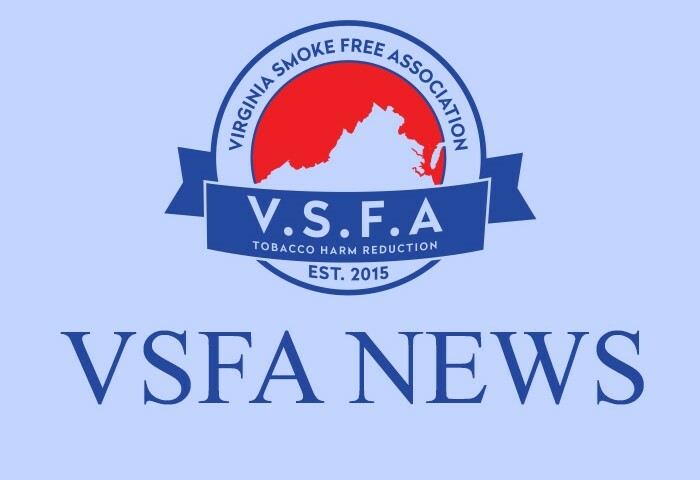 About us: The VSFA is a 501(c)(6) trade association in the state of Virginia representing vapor retailers and manufacturers of electronic vapor devices, and flavored e-liquids. Our members include 67 locations, the overwhelming majority of which are small businesses. Many of our small business members are veteran-owned, woman-owned, and family-owned. The state of Virginia has roughly 400 vape shops. These shops can be found in every region of the state. We employ approximately 1,400 people, paying full time wages, and tens of thousands of sales and employment taxes to our state. invoke or otherwise infringe upon existing trademarks, trade names or trade dress, particularly or if they are associated with products that are or were primarily marketed to Minors. We also do not allow health claims on packaging or marketing of vapor products that state the products provide therapeutic value or claim to be a smoking cessation product, and we support enforcement that imposes penalties on retailers or others who sell or provide vapor products to Minors, and Minors who are found in possession of vapor products. Most retail stores are “adult-only” establishments by restricting access to entrants. VSFA members card anyone that appears less than 27 years of age. Participate in the national We Card program. o Full support of state laws, and local ordinances, that impose penalties on retailers or others who sell or provide vapor products to Minors, and Minors who are found in possession of vapor products. o Implementation of strict underage policies requiring that their employees card anyone who appears fewer than 27 years of age in order to purchase vapor products. o Vape shops shall ask Minors who are unaccompanied by an adult to leave their shop immediately. o All Vapor Products should be displayed behind the counter or in some other enclosed display which is not accessible without the assistance of a sales representative in convenience stores or other retail establishments where Minors may be present. o All online sales of Vapor Products should be restricted to adults through either direct verification of government issued photo ID upon delivery of product or through the use of age verification technologies provided by independent third party agencies using public records databases. Because our brick and mortar store owners are committed to helping adult smokers, we place a heavy emphasis on all efforts to reduce youth access to ENDS products and exposure to ENDS marketing. In 2014 the state of Virginia passed a bill modifying Code § 18.2-371.2: to read “No person shall sell to, distribute to, purchase for, or knowingly permit the purchase by any person less than 18 years of age, knowing or having reason to believe that such person is less than 18 years of age, any tobacco product, nicotine vapor product, or alternative nicotine product.” This law has prevented youth access in Virginia since 2014. VSFA members have successfully passed retail inspections at a higher rate than any other nonprofit organization in the state of Virginia boasting 100 percent compliance. Is there really a teen epidemic? Campaign for Tobacco Free Kids would have you think so, however teen usage is dropping. The CDC’s own studies show this. i Since 2015 high school usage has dropped by an amazing 30% and continues to do so. Our association was personally part of a local news story on Channel 12 here in Richmond Virginia. The purpose of the story was to try to raise the awareness of parents about the dangers of teen vaping. VSFA told parents what to be on the lookout for and how to identify the devices. This story was, of course, focusing on the Juul. The reporter had contacted 4 of the local major School Systems to inquire about if they had seen any rise in the trend of teen vaping. One school system said they had had a couple of instances but had the situation well under control, several others said they had heard the stories but had not had any reported issues, and the fourth system did not respond. At the end of the story, I Virginia Smoke Free Association was glad to be of service to raise parent’s awareness but it turned out to be a story that was much to do about nothing. Much of what we do is educating not only our members, but one of our core missions is to educate the general public about the pros and cons of vaping. Specifically we concentrate on proper compliance and how our members protect minors. How our Customers Use Flavors: When a customer first comes in to a retail establishment they are looking to quit combustible tobacco. VSFA members noticed that most are initially looking for a tobacco flavor that best mimics their particular brand of cigarettes that they currently smoke. Some want to start vaping non-tobacco flavors right away to separate away from smoking. For 95% of our customers, who start out with tobacco flavors, about 2-6 weeks after being off of traditional tobacco products their taste buds come back to life and tobacco flavors taste bad to them. When this happens, they come back specifically seeking out a variety of different flavors that their newly defined taste buds can experience i.e. fruit flavor, desert flavors, candy flavors etc. Even once they have switched to one of these flavor profiles, we are seeing an increasing trend in consumers wanting to expand their pallets by trying new flavors at a constant rate, 1-2 new flavors per week. Some people eventually settle into one flavor while others are constantly trying different flavors to keep from getting board or burned out on a particular flavor. We are a very unique industry and vaping is very individualized. What works for one person may not work for the next. This is why there is such a wide range of hardware, for different amounts of power and battery life as well as different liquid types, flavors and nicotine levels in our industry. What we have learned at VSFA is that each former smoker is different, adults do indeed like flavor choices, and that this continual rotation of flavor profiles is key to our consumer’s success in staying with vaping and far away from traditional tobacco products. The Impact of Flavor Ban or Restrictions on VSFA Customers: We have been working diligently with our customer base to send in submissions to let FDA know their sworn testimony and personal stories to express the impact that a flavor ban or restrictions would have on their continued success of staying off of deadly combustible cigarettes. We have been surprised at how vocal they have been on this topic. We are not surprised that they like choices, we are, however, surprised to learn how much flavor choice influences their decisions on whether to continue to vape or return to smoking cigarettes. An overwhelming 99% of our member customer base would be directly affected by a flavor ban or restriction. Consumers have told us that they would look for products on the black-market, they would figure out how to make their own, or they would go back to smoking combustible tobacco cigarettes. All of these options could have a potential negative public health impact. If they are buying products off the black-market, there is no quality control system in place, no assurance that the product they buy is safe because it is potentially being made at unsanitary conditions, and no good manufacturing processes in place to ensure the e-liquids are consistent and verifiable. Our final concern at the VSFA is that safety precautions and proper handling of non-diluted nicotine would not be utilized in a black market and Do It Yourself (DIY) scenario’s, which could have deadly consequences for not only the manufacturer but also for the end consumer and possibly small children who would be exposed to those dangers. If proper precautions are not taken and proper testing is not initiated, this highly concentrated liquid nicotine could be calculated incorrectly and will have dire consequences to a small child. Virginia Smoke Free Association does not believe the FDA is comfortable with putting consumers at risk with so many potential hazards surrounding black market sales of e-liquid. We feel that if FDA does enact a flavor ban or restrictions on flavors, this is exactly what will happen; black market expansion. The Impact of Flavor Ban or Restrictions on VSFA Members Businesses: Flavored e-liquid produces about 75-80% of profit in vape shops. On average approximately 65% of overall sales of our members’ business is flavored e-liquids. If you take that away you are ensuring businesses in Virginia will close, reducing the tax revenue for our state, and more importantly the FDA will be taking away our membership’s way of life. The FDA has commonly suggested that e-liquid flavors be limited to tobacco and possibly menthol, our members would never be able to sustain our businesses with just the sales of tobacco flavored e-liquid. This would close down approximately 400 small businesses in Virginia, which would also put 1,400 people in Virginia back in the un-employment line. This type of heavy regulation would certainly devastate our fledgling Vapor Industry in Virginia. Conclusion: Our membership is comprised mainly of small businesses. We represent mom and pop brick and mortar shops helping adult consumers that want to switch to a better alternative to get their nicotine. Our members feel that their job is to help them make the change away from deadly combustible tobacco. At Virginia Smoke Free Association we can empathize and understand that protecting youth should be a priority, and it is for our members. So far however, the evidence from many recent studies, including reports from the CDC and The National Academies of Sciences, Engineering, and Medicine, are not showing an increase in youth usage but quite the opposite. No matter how loud anti-tobacco groups anecdotally claim there is an epidemic in youth usage, they have failed to back up that claim with substantial scientific data. Nicotine prohibitionists have been claiming for years that e-cigarettes are a “gateway” to smoking addiction, but studies have repeatedly shown that they’re not even a gateway to regular vaping for youth, much less smoking.ii Both teen smoking and vaping are down and continue to trend that way. Smoking is at an all time low for both youth and adults. We have achieved in the vaping industry what decades of public health campaigns have failed to accomplish. VSFA also has real concerns about the Campaign for Tobacco Free Kids false narrative and news hype about a fake epidemic, bringing vaping to the attention of more youth again, causing more to try these adult products. We are very aware of their subpar tactics of running misinformation ads and paying teens to vape then using them in their false propaganda. There are laws in place here in Virginia that are against the sales to minors, enforce them to the fullest extent we support that 100%. VSFA agrees with enforcement such as fining shops and C Stores that are selling vapor products to minors. We also agree with holding minors accountable for their actions if they are caught with flavored e-liquid. 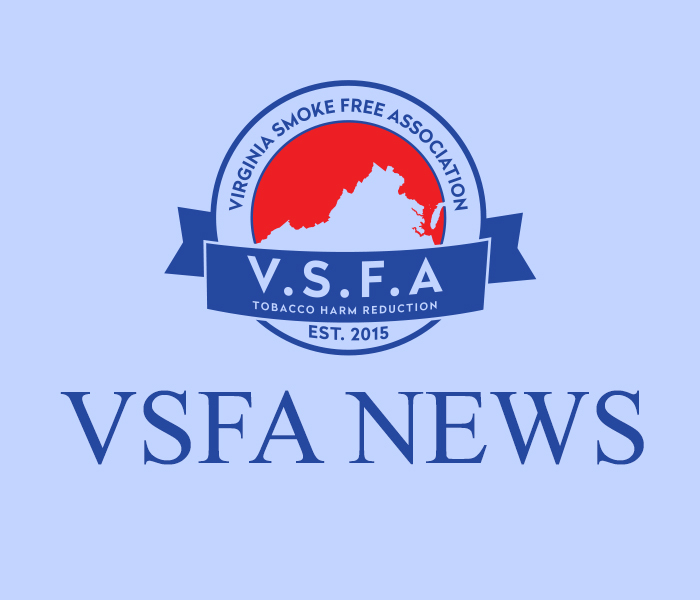 Virginia Smoke Free Association DOES NOT agree to deny Adult Smokers an alternative way to get their nicotine. VSFA is asking that the FDA not sentence Adult Vapers, who have already made the switch vaping, have no other option but to turn back to deadly combustible cigarettes or black market products that are not controlled because flavor options are banned or severely restricted. FDA has to ask itself, is following a false narrative worth condemning millions of adult Americans to certain illness or premature death, that you could have been prevented? i i Centers for Disease Control and Prevention, Fast Facts and Fact Sheets: Smoking and Tobacco Use, accessed September 8, 2017, https://www.cdc.gov/tobacco/data_statistics/fact_sheets/fast_facts/index.htm. Government’s effort to suppress vaping—the most promising antismoking product ever created—is part of a broader scandal. https://www.city-journal.org/html/corruption-public-health-15323.html.